A dock jetting out into the wetlands gives people a better view of the many birds and plants living there. Photo by Kyle Wasson. PALO VERDE NATIONAL PARK, Costa Rica – Home to more than 400 species of animals, Palo Verde National Park is slowly being taken over by an alien plant. Typha is a trouble plant that dominates the wetlands during the rainy season, destroying other plants and disrupting the wildlife that call Palo Verde home. Also known as cattail, typha prevents animals from easily accessing the food they need, according to aquatic plants researcher Rafael Ramirez. 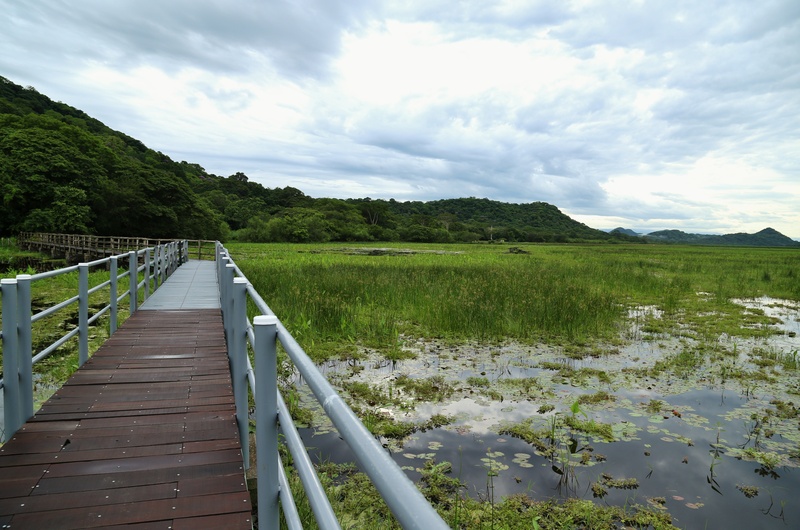 Located in northwestern Costa Rica, the park is one of the most important wetlands in Central America. During the rainy season most of the property is covered in wetlands that stretch as far as the eye can see, giving a clear view of the mountains in the far distance. Located along Río Tempisque, the national park used to be a cattle ranch, home to more than 1,000 cattle. Once researchers discovered in the late 1970s that the 71-square-mile area was a wetland, the government set about making it a national park to preserve the copious amounts of wildlife found there, according to Ramirez, the administrator of academic service for the Organization for Tropical Studies field station at Palo Verde. Palo Verde is the only national park that allows and is required to have cattle grazing. Cattle have been on the land since the 1920s. This unique landscape is home to 75 species of mammals, 55 species of reptiles and amphibians, and 279 different species of birds – a heavenly place for wildlife. Scientists on the site have been maintaining the land for the birds by taking out the intruding typha plant twice a year so that migratory birds can recognize the wetlands. This helps the birds, but the removal methods cause damage. “Typha is very aggressive to the site,” Ramirez said. It causes many disturbances and the researchers feel they need to do something to keep the site clean. There are two solutions to removing the typha plant. One involves using the cattle that live on park grounds to eat the cattail. But they cause problems as well. Researchers at the OTS field station find the cows annoying and don’t think they earn their keep. Cows destroy the scientific devices used for studies set up along the wetlands, said researcher Davinia Beneyto. According to naturalist Sergio Padilla, the cattle cause more harm than good and move too slowly to make a major dent in the cattail. The second removal method is a bit more up to date but still has a down side. 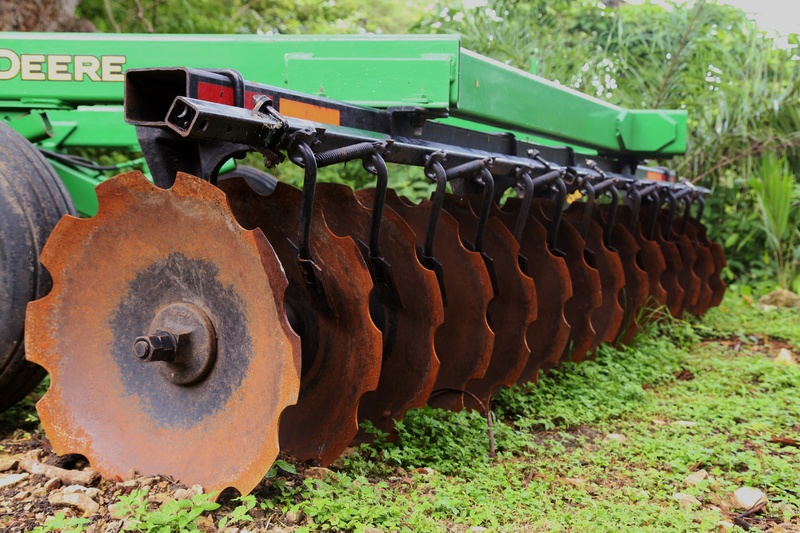 Researchers use heavy machinery to rip out typha twice a year. OTS has spent a lot of money buying tractors to get the job done. The park ran a campaign called “Save the Wetlands of Palo Verde.” Park rangers called companies and people asking for donations to buy tractors for the park. The fundraising drive generated about $300,000, Ramirez said, which was used to purchase one tractor with the remaining money going toward maintenance around the park. The park receives money from the government and donations, and the rangers disperse the money where it is needed most. Tractors used to rip out the cattail are parked near the wetlands. Photo by Kyle Wasson. The tractors “crush up the plant, open up the place, open up the water,” Ramirez said. This process comes at a cost to the park though, with gas costing up to twice the amount it would take to fuel a car, according to Padilla. To save money, the park uses its own staff to perform maintenance and repairs on the tractors. Opening up the wetlands benefits the birds who pass through every year, but both methods of clearing the typha harm the underwater biodiversity. “Many, many species will suffer,” Ramirez said. Hermit crabs are among the species living in Palo Verde’s waters. ”We do not know what the final effect is on this very beautiful species,” Ramirez said. The biodiversity of all the species living in Palo Verde National Park set it apart. With the natural process of the typha plant taking over, scientists have decided to disturb the ecosystems by ripping out the typha plant for the sole benefit of migrating birds. The effect of this process is “one big question mark,” Ramirez said. So the cattle stay, all 300 of them, and the tractors keep them company. Ramirez said it is difficult to know whether more cattle is better for the environment or bringing in machines to do the job is best. Studying what method is the most effective could not only save the park time and money, but could also help other parks infested with some sort of fast-growing plant. Ramirez said that more research needs to be done on the subject to come to a conclusion, but right now time and resources are too scarce to conduct such an experiment.